With no press-sheet included, and an almost total lack of information on the CD cover, I had to do a quick trawl through the internet to glean any facts about who or what might constitute Graffiti 61. It transpires that this is a side project of Dominic Massaro, bassist for Christian progressive metal group Torman Maxt, who hale from Ft Myers, Florida. While the parent band have drawn comparisons with Rush and Dream Theater, Graffiti 61 is anything but metal. In fact, this short 36 minute disc contains music from another universe entirely, one that deals in wholly synthesized mind journeys. 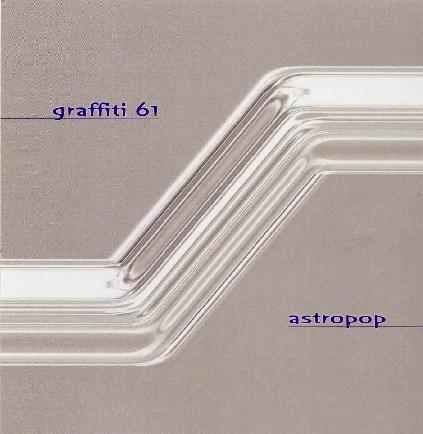 There are no titles for the seven instrumental tracks that make up “Astropop”, and even the album title offers no real clue as to the contents of this disc. If I had to file Graffiti 61 into any pigeonhole, it would have to be ambient trance, but in actuality the listener is free to fill in the spaces between the notes for themselves. Each track is about five minutes in length and consists of melodic chimes and swirls that seem to blend into each other in harmonious unity. Quite simply, this is the ultimate chill-out disc, relaxing and yet uplifting. The notes descend like water droplets through a rainforest, and by the final track you can’t help but feel renewed and refreshed. This album can take you through either inner or outer space, and would be perfect for meditation. “Astropop” is the sixth album solo album by Massaro, and on the strength of this, I would be interested to hear his earlier works which include evocative titles such as “Space Tourist”, “Mind Blossom” and “Droning Velvet”. This album is perfect for anyone who would like to experience the light and uplifting side of ambient music.